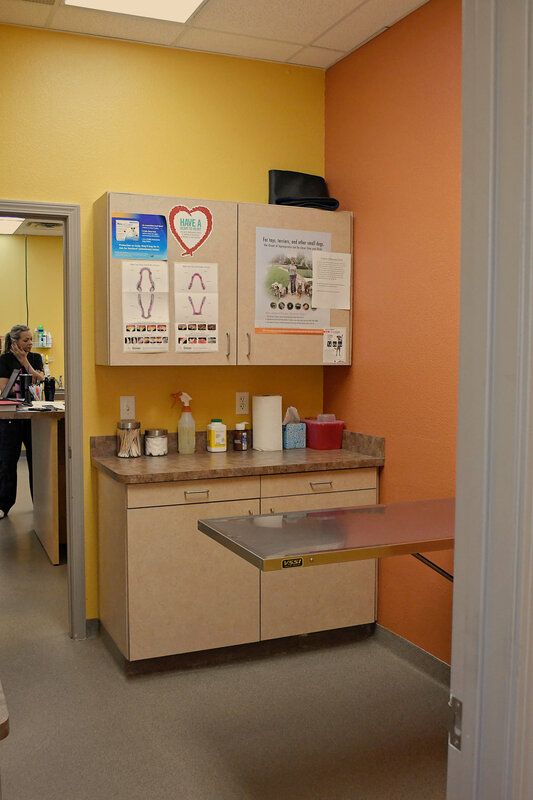 Dr. Jones opened Strothertowne Pet Hospital in 2009, with a desire to get back to one-on-one patient contact where clients and their pets are treated like family and listened to rather than treated like a number. Personal attention is what our clinic is all about. 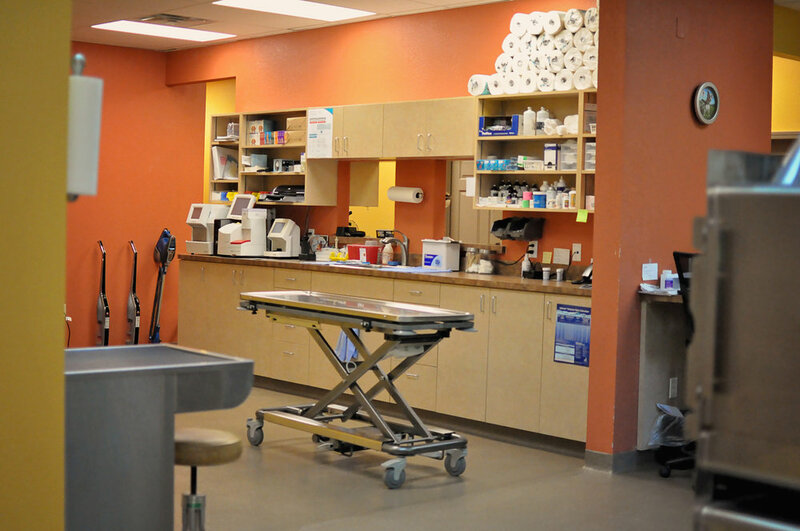 We are a full service veterinary hospital providing wellness exams, vaccinations, surgical procedures, dentals, as well as orthopedic consults. We are located on the southeast side of Lee’s Summit, Missouri, and are conveniently located close to 50 and 291 Highways. We strive to provide a family atmosphere where meeting you and your pet’s needs are priority one. Feel free to stop in and see us and our facility any time! Born and raised on a farm in Carthage, MO, Dr. Jones knew from an early age that he wanted to be a vet. He graduated from the University of Missouri-College of Veterinary Medicine in 1999, and practiced in Ohio and Pennsylvania before moving back to his home state. Dr. Jones lives in Greenwood with his wife Julie and four children and a host of four-legged family members. When not at work, he enjoys spending time with his family and working on home projects. Dr. Vale joined the Strothertowne staff in 2015. 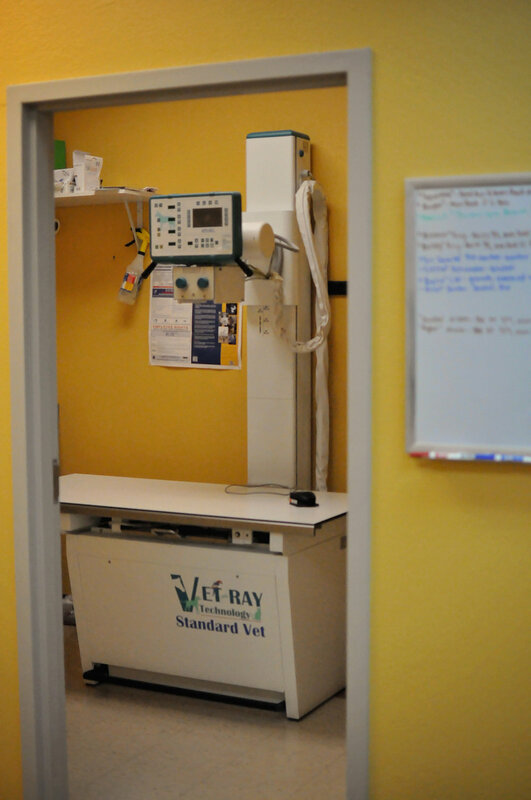 She has been practicing veterinary medicine since 1992. Born and raised in Kansas City, Dr. Williams has been practicing veterinary medicine for over 20 years and joined the Strothertowne staff in 2019. Animals have always been important in her life and she currently shares her home with one small kitty and three dogs—Maddie the Lhasa Apso, Caitlyn the Irish Wolfhound and George the English Springer Spaniel. When she isn’t taking care of animals at work and at home, she enjoys reading, crochet and belly dancing. Julie was born and raised in Summitville, IN. She has worked in veterinary medicine for 30 years. When not at work she loves making lists of things for her husband to do around the house, spending time with her dog, chickens, and cats. Michelle graduated from Jefferson Community College of Veterinary Technology in Hillsboro, MO in 2010 as a Registered Veterinary Technician (RVT) with an Associate Degree in Applied Science. She joined the Strothertowne Pet Hospital team in 2012 when she moved to the Kansas City area to be closer to family. She has one daughter who lives in Springfield and a Doberman Pincher named Ruger. Michelle has always had a passion for working with animals, and is grateful that her career choice allows her to spend her days helping them. When she isn't working, she enjoys spending time with her dog and hanging out with family, watching Royals or Chiefs games. Jen lives in Holden with her husband, dogs, horses, cat, and chickens. She has her Bachelor's degree in Wildlife Biology and is an avid lover of animals and nature. When not at work she is usually doing something with her horses or doing something outside. Jessie began her career in the field of veterinary care in 2015. After having been so impressed with the compassionate care of Dr. Jones and the rest of the staff displayed to her and her family when her beloved pet Jack was diagnosed with cancer, she knew Strothertowne was the place for her. She is a proud mother and grandmother to the cutest little boy in the world, and enjoys spending time with her Golden Retrievers Gypsy and Griffin who bring her so much joy. Kelley is life-long animal lover and when not at work or hanging out with her husband or one of her four daughters, she enjoys spending time with her horses and dogs. Gabbie joined the Strothertowne Pet Hospital team in October of 2016, and is one of the friendly faces you see when you walk in or hear on the phone when you call to schedule an appointment. Gabbie grew up in Lee's Summit, but now lives in Greenwood with her three dogs Lucy, Sadie, and Harper. She has a passion for all animals, and is currently in school to become a registered vet tech. When not at work or in school, she enjoys reading, taking care of plants, and hanging out with her dogs. When not working at Strothertowne, Diana and her husband Rik keep busy as the grandparents to seven amazing grandkids ranging in age from two to 13 years old, and share their home with four Spinone. She occasionally competes with her dogs in rally, conformation, and obedience, is the membership secretary for the Greater Kansas City Dog Training Club, and is a board member of the Raytown Main Street Association. 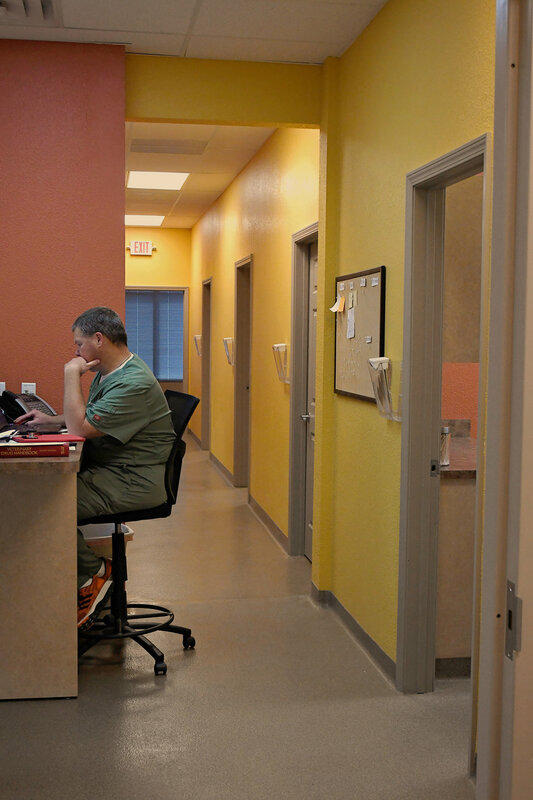 Mary started working in the vet field around three years ago and she can’t ever imagine doing anything else. She has been married for 15 years, raised three children and now gets to enjoy being a grandmother to her adorable granddaughter. She has five dogs, eight horses and one cat and recently started volunteering with equine rescue and rehabilitation. She enjoys horseback riding, camping and snuggling on the couch with her pups. Ethan attends Longview College, and enjoys working with computers, playing video games, and reading. His favorite part of working at Strothertowne is getting to interact with all of the animals, and is especially fond of cats. Trenity is a college student who is a life-long animal lover. She enjoys spending time with her dogs, chickens, ferrets, and rabbits. Originally from a small town in Indiana, Jessi now lives in Kansas City with her husband, two dogs, Darla the Rottie and Chico the Chihuahua, and her cat, Mr. Big. In her spare time she enjoys spending time with family, being outdoors and hanging out with her husband and pets. She has been working in the veterinary field for over three years and loves that every day is a new adventure helping animals made even better by the puppy and kitten cuddles. She particularly likes seeing animals recover from illnesses and leave the clinic as healthy pets.